Railroad enthusiasts could consider the Baltimore train museum—the B&O Railroad Museum—one of the most significant collections of railroad treasures in the world. The location itself adds historical value: Mount Clare is considered to be a birthplace of American railroading. Not surprisingly, the museum and station are a U.S. National Historic Landmark. This Baltimore train collection includes locomotives and rolling stock, historic buildings, and small objects that document the impact of the B&O Railroad. But there’s so much more! This Baltimore train museum nurtures the love of railroading with a number of special exhibits and programs just for kids. 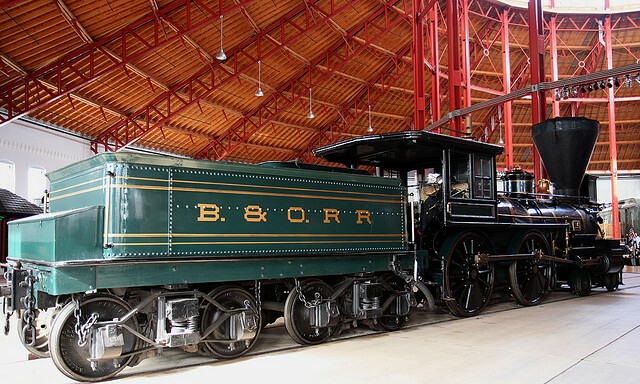 The Baltimore train museum’s locomotive and rolling stock collection displays historically significant pieces from the B&O and other Maryland railroads and includes the finest collection of 19th century steam locomotives. The small object collection covers almost every facet of railroading and includes clocks, pocket watches, textiles, lanterns, dining car china, silver, fine art, communication devices, signals, shop equipment, and an assortment tools and artifacts used on historic occasions. The War Came By Train serves as the B&O’s primary attraction for the five-year commemoration of the Civil War’s sesquicentennial. This exhibit concludes in December, so the time is now to see it! By making connections between the Civil War and the history of American rail, the Baltimore train museum develops important understandings about the role of transportation and industry during the war. Visitors at this Baltimore train museum may take a 20 minute round trip train ride along the first commercial mile of railroad track laid in America on the Mile One Express. Train rides at the B&O in Baltimore are offered Thursday – Sunday, April – December & weekends in January. The train ride schedule is Thursday & Friday at 11:30 a.m., Saturday at 11:30 a.m. & 2:00 p.m., and Sunday at 1:00 p.m.
For kids, Choo Choo Blueville is a fictional town personalized by the B&O Railroad Museum’s new mascot Choo Choo Blue. This kids-only exhibit offers children a soundscaped, three minute kiddie train ride throughout the land of Choo Choo Blueville. During this holiday season the B&O Railroad Museum is offering train rides to visit visit Mount Clare Museum House and experience A Carroll’s Christmas. Learn the story that connects these two great museums and experience a colonial holiday! Several special-event weekends feature round-trip train rides to Mount Clare. Click here to see times and special events. Both children and adults can ride the B&O Train Carousel. Made exclusively for the Baltimore Train Museum, this merry-go-round features historical images of B&O locomotives and logos and custom made figurines of locomotives, cabooses, vintage horses, and stagecoach. Of course we’re partial to Ellicott City, but the Ellicott City Station is a must-see aspect of the Baltimore train museum. The B&O Museum Ellicott City Station is the oldest surviving railroad station in America, and was the original terminus of the first 13 miles of commercial railroad in the country. The site features the Main Depot building, the freight house, a replica of the first horse-drawn passenger rail car—the Pioneer, and a 1927 “I-5” Caboose.